A new poll finds more Americans see China as their greatest enemy than any other country in the world. For the first time ever, more Americans view China as America’s greatest enemy than any other country in the world, according to a new public opinion poll. According to a recent poll by Gallup, 20 percent of Americans view China as the country’s greatest enemy, slightly more than the 16 percent of Americans surveyed who said the same thing about Iran and North Korea. This is the first time that China has topped the list since Gallup began asking the question in 2001, as well as the first time Iran hasn’t topped the list since 2006. It should be emphasized that the poll numbers suggest that China became public enemy number one in the U.S. less because of growing hostility toward it than because of reduced anxiety over Iran. Most likely because of the election of Hassan Rouhani as president and the interim nuclear agreement, American views on Iran have improved markedly over the last two years. Indeed, whereas 32 percent of Americans felt that Iran was their country’s greatest enemy in 2012, half that number, 16 percent, said the same thing this year. By contrast, the number of Americans citing China as America’s greatest enemy has remained largely stagnant since 2012. Other countries, most notably North Korea and Russia, have seen significant increases in the number of Americans citing them as their country’s greatest enemy since 2012. 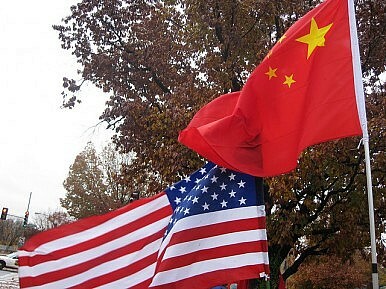 Another recent Gallup poll has found that the majority of Americans have a generally unfavorable opinion of China. Specifically, 53 percent of Americans have a very or mostly unfavorable view of China, compared to 43 percent who have a very or mostly favorable view of the Asian giant. These numbers are fairly consistent with the views expressed every year since the Tiananmen Square crackdown, after which America’s views of China plummeted. In the ten years between the normalization of bilateral ties and the Tiananmen Square crackdown, Americans had a much more favorable view of China, according to Gallup’s polling. Still, while more Americans may view China as the greatest enemy of the U.S., they have the least favorable views of North Korea. Only 11 percent of Americans expressed favorable views of North Korea—which is about equal to the approval ratings Congress gets from Americans—making it the least popular country in the U.S. That distinction previously went to Iran, although the last year has seen its favorability rating among Americans jump from 9 percent to 12 percent. The majority of Americans surveyed by Gallup also continue to mistakenly believe that China is the largest economic power in the world, despite the fact that the U.S. has a GDP nearly two times the size of China’s. According to those surveyed by Gallup, 54 percent of Americans said that China was the world’s foremost economic power, with only 31 percent of respondents saying the same thing about the United States. About 7 percent of Americans—perhaps those who are stuck in the 1980s—believe that Japan is the world’s largest economic power, while smaller numbers of others cited the EU, India, and Russia.